The Amazon Rainforest gets all the love. 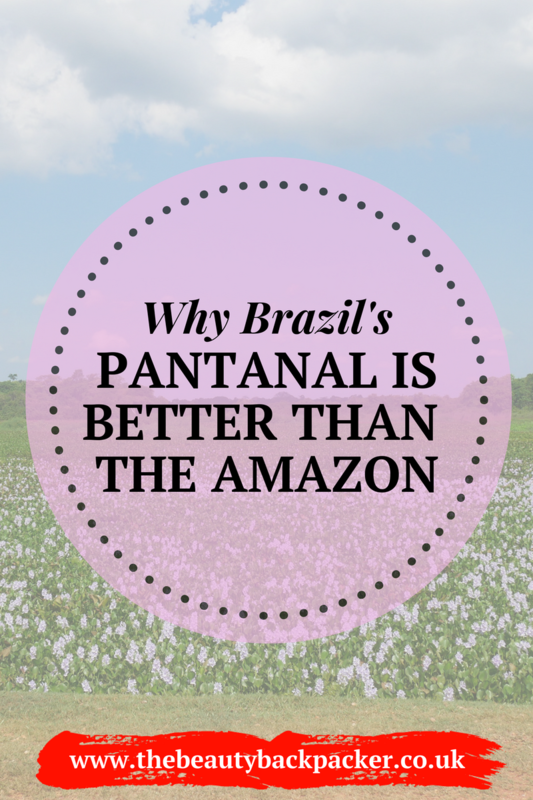 Though it's well deserved, it really ought to share some of the limelight with its lesser known neighbour: the Pantanal. These beautiful wetlands are well and truly something to write home about. Like on a real postcard. So I'll hit with you a few facts first. I'll try and keep this as brief as possible. The Pantanal is the largest wetland in the world, 10x the size of the Florida Everglades. This 196k square foot area is so large it sits not just in Brazil but in Paraguay and Bolivia too. During the rainy season it's mostly submerged in water but when the rains fade, both the jungle and savannah surface. It's home to the elusive jaguar as well as possibly the most wide-ranging bird varieties on the planet. Not surprisingly, the Pantanal has been declared a UNESCO World Heritage Site for its sheer biodiversity. Even David Attenborough claims this region is one of the best places to see wildlife on the planet. If that doesn't convince you to go, I simply don't know what will. We decided to visit because we were keen to explore what Brazil has to offer beyond the beaches (though I did love those), the samba and the caipirinhas. The state of Mato Grosso do Sul, which houses the Pantanal and is known as Brazil's 'wild west,' felt like the perfect choice. Since the area is still relatively undeveloped for tourism, we opted for a three-day guided tour with Cuiaba Pousada Safari Tours. You can certainly make a trip to the Pantanal on your own, but I'd recommend going with a trusted guide who will not only know how to navigate the area, but can also teach you so much about the local wildlife. Our brilliant guide, Laercio, grew up in the Pantanal and knows every single creature, trail and scary jungle sound like the back of his hand. Now that I've completely sold you on the wonders of the Pantanal (though if you're reading this you were probably already interested), its only fair to warn you too: this trip is not for the faint of heart. Prepare yourself for grim hostels, walks in the wild, a constant flurry of insects and skipping most of your daily showers. If, like me, you can work yourself into a wilderness-babe groove, you'll be absolutely fine. But if you're the glamping sort, you might need to research more luxurious options. We booked three days, two nights, including room and board and our private guide. Nothing glam, like I said. But this included safari drives, boat trips, horse riding and guided day and nighttime hikes. This all came to around $370 (US dollars) per person. So not dirt cheap but considering how remote you'll go, this doesn't at all feel unreasonable. Most Pantanal tours offer a Jaguar or non-Jaguar experience. You'll pay more for the Jaguar tour. These take you deeper into the wetlands where the jaguars linger on much smaller patches of dry land, so you're more likely to spot one. We opted for the traditional tour and just crossed our fingers that we'd bump into one anyway. I will say, the hostels were rough. I woke up covered in mosquito bites and we both refused to sleep under what were very dirty sheets. But the tours themselves were absolutely breathtaking. On our first morning drive we admired a family of parakeets building their nest. On our sunrise boat rides we spotted toucans, ibises, storks, parrots, macaws and more. I was also startled by one too many caiman for my liking. We climbed to the top of a rickety old treehouse and watched the sun set over the treetops. On the road and by horseback we stood in awe of the region's spectacular landscapes: look to your right and you're in the depths of the jungle, look to your left and you're staring out into the wide savannah. There we spotted tapirs, capybaras (the largest rodents on earth), deer and more. After three days of intense safari, I came to fully appreciate why it's been said that you can spot more wildlife in the flat terrain of the Pantanal than you can in the deep jungles of the Amazon. So if you're looking for a wilderness adventure that's a little off-the-beaten track, seriously consider adding Brazil's Pantanal to the top of your bucket list. You might have to rough it a bit, but I promise it's an experience you will never ever forget.